Hi, my name is Jake Moore. I am 16 years old, I am currently an 11th grader at Karns City High School, and I live in Bruin, Pennsylvania. This is a picture of my set, and my friend Jared Bowser's set. 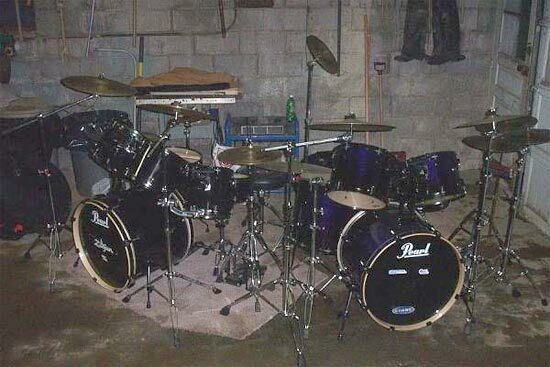 I bought my set last March, it is a pearl export. Jared's is the same set, but his is purple that fades to black and mine is solid black. I have been playing for almost a year and Jared has been playing for almost 7 years, but I have caught on quickly. Jared and I were putting something together for a "talent show" at our school and we had the bright idea to combine our sets, but make it so we could both still play our own. So this is a picture of my set and his combined.. hope you enjoy.